Earlier this week, one of my colleagues approached me and asked me to pray over her. She had been sleepless these past few days because of a comment blurted out by another colleague against her. And since I’m aware of the personalities of the people involved, and how different they were from one another, I simply told her to just shake that comment off her mind and to continue in giving her best in everything she does. Well, if you’re in the position of my colleague, you’d rather say that my advice has always been easier said than done, considering that we’ve been sashaying on this world having to go through the opinion of others. Having gone through the same experience (also with the same colleague), at the back of my mind I thought, probably that’s how the world is made – whether what you’re doing is good or bad, right or wrong, people will always have something to say. People will always place other people in boxes with labels according to their own terms. Admittedly, I am also guilty of this- being boxed in and boxing others in, too. And while I’m in it, I had to go plunging through the opinion others had on me, even to the extent that it affected how I see myself, that it left me not doing what I long wanted to do, that it left me setting aside my intentions, and also greatly influenced how I respond to people. Having gone through this was a long and difficult struggle. But thankfully, God poured out His grace to make me realize that it’s not the way it should be. Even until now, other people opinions still emerge from everywhere. People will always be beyond our control, but it’s our reaction or response to these opinions that we can. That’s a given. And it’s also the same thing I would like to impart to everyone going through the same struggle as me and my colleague was. 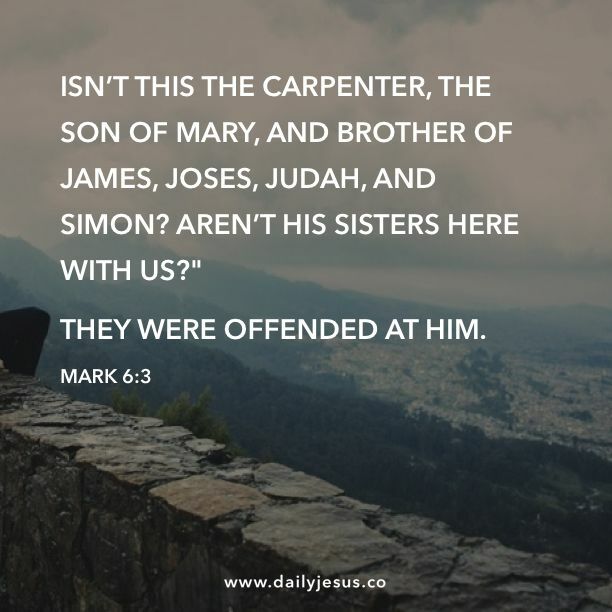 Even Jesus was not immune to the denigration of others, and that while He was teaching in the synagogues and throwing points of wisdom, people took more notice of His worldly identity (being a carpenter’s son) instead of His eternal identity and glory that was already in front of them. I wonder, what if Jesus took these labels and comments and dig them deep within His heart, instead of following the will of His Father? Thankfully, Jesus didn’t or else, there will be no salvation to celebrate. Just like Jesus, allow not the opinion of the world keep you from doing what God is telling you to do. 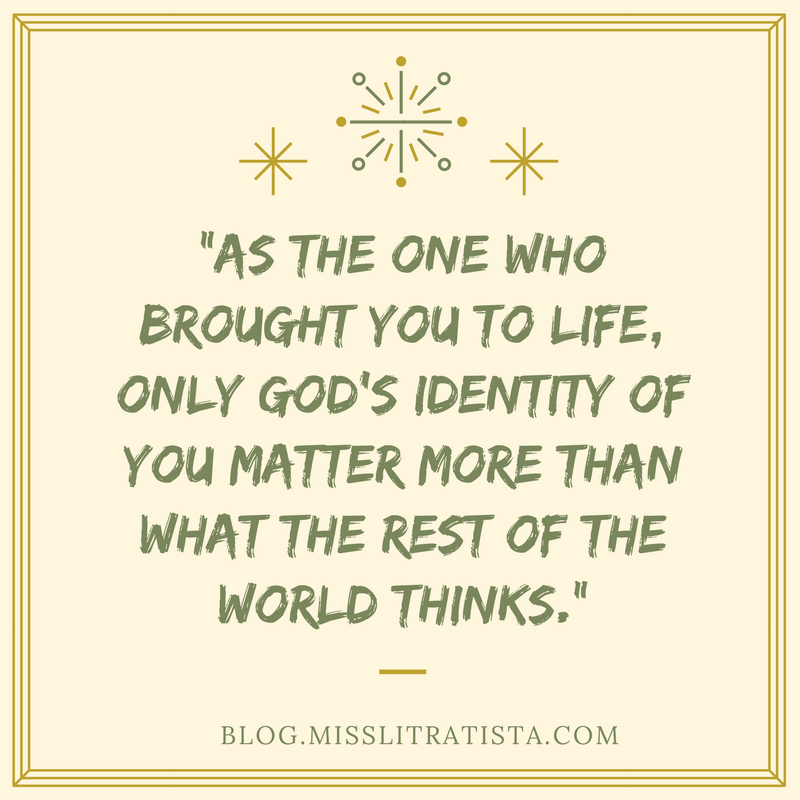 Rather, dig deep into the truth of His Word, because as the One who brought you to life, only God’s identity of you matter more than what the rest of the world thinks. Jesus did not allow the opinion of others to hinder Him from achieving what He is called to do, so why should we? Knowing ourselves better will also allow us to screen what to take in and what not to. While some opinions may be taken in as constructive criticisms and as basis for improvement, may we not give power for it to influence us more than God’s Truth does. And if worse comes to worse, remember to Whom you truly belong. I hope that you may be filled with the love of the Lord to know how wonderfully you are made, and nobody else has the right to tell you otherwise.